Performed an efficacy study, generating imaging data and final reports from our monitored use of ultrasound, X-ray, and MRI. Used CT and X-ray to determine the success of new groundbreaking medical instrumentation. NIH-funded study evaluating the use of targeted-contrast ultrasound for naturally occurring canine prostatic cancer, given the similarities between canine and human prostate cancer, in this 20-patient pilot study. Through our ultrasound imaging, great insight was made into the benefit of this agent. Through the monitored use of CT and X-ray, we evaluated the success of a new cancer-related drug. 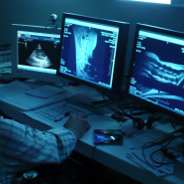 Determined the success of new groundbreaking medical instrumentation, using CT and X-ray.